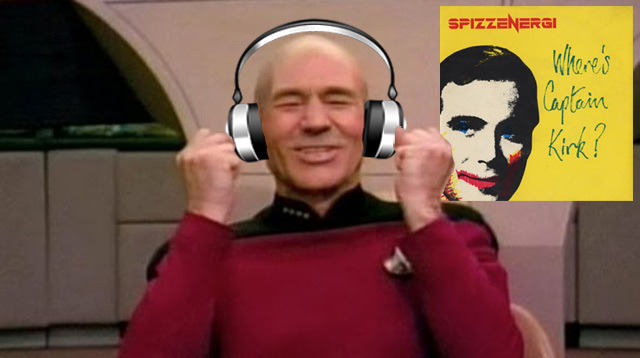 Picard Of The Pops: Spizzenergi | Warped Factor - Words in the Key of Geek. Chris Morley is punk and disorderly. Curios come in many forms, but in this context is there any bigger than Spizzenergi's unlikely punk hit Where's Captain Kirk? Lead singer Spizz & keyboard player Mark Coalfield appear to have based it on a dream - albeit one shared by many. After all who wouldn't want to captain the Enterprise? Six months later a sequel came with Spock's Missing, the final part of a trilogy arriving later with Five Year Mission (Featuring The Return Of Spock). Melody Maker named the inspired original daydream Single Of The Week upon its release in December 1979, while REM would later record a cover of it as a Christmas treat for their fan club members. The late great John Peel would also dub it "the only Star Trek tribute worthy of the Enterprise's jukebox", and the NME included the ode to perhaps the greatest of its captains in a list of the best indie singles ever in a countdown published in 1992. Or is this the start of my insanity? Was it you, was it me who was in all the time? "Now plans are afoot to try to give the kiss of life to the idea of "independent music" by establishing a new indie chart. One of its prime movers is Iain McNay, the founder of the veteran indie label Cherry Red, whose brainchild the original indie chart was 30 years ago. He has worked with the Official Charts Company, the people behind the Radio 1 top 40, and changed the rules to ensure the charts can't be infiltrated by the fake indies that have grown like weeds since the early 90s. The old independent chart was the result of a morning whim of McNay's. "I woke up one morning in December 1979 thinking, 'Why doesn't someone compile a proper independent chart based on accurate sales information?'" he says." Spizzenergi were one of Cherry Red's signings, & got a mention. "Where's Captain Kirk? easily sold enough in total to reach the national top 40, but never did because sales "weren't in a big avalanche. Rough Trade kept selling out and repressing it. It was in the independent chart for a whole year." Glancing at the first chart, Spizz recalls the acts kept at bay by Where's Captain Kirk? : Delta 5 ("They were in our zone, scratchy guitars, on Rough Trade"), the Monochrome Set ("Ah yes, they were modern"), the Dead Kennedys ("Jello Biafra bit my leg in San Francisco – sounds like a Sun headline, doesn't it? "), Scritti Politti ("clever"), and, at No 2, Day Trip to Bangor by Fiddler's Dram. "That was not a punk record," Spizz says,gravely." It reached number 40 in Peel's Festive Fifty for 1980, too! Captains of indie Enterprise, at least?